AS YOU MAY HAVE HEARD BY NOW, ARE 5.0 IS HERE. NCARB HAS BEEN TEASING IT FOR SEVERAL MONTHS NOW (YEARS EVEN) AND THE MOMENT OF TRUTH IS UPON US. This week, ARE 5.0 will become the baseline examination to test the competency of future Architects in the United States and elsewhere. You could be on the path to licensure right now, or perhaps, you’ve already achieved it. Either way, the ARE 5.0 marks a milestone for friends, co-workers, peers, and employees who will be affected in the years ahead. In the weeks to come, I’ll be writing more about the changes you can expect to see. In the meantime, I’ve compiled a series of useful resources to help you navigate the changes and work through the exam itself. Full Disclosure: Some of the links below are ‘Affiliate’ Links. That means that if you end up purchasing something, I will receive a small commission to help keep the lights on at Evolving Architect. No worries if you don’t. I just wanted you to know. Thanks! This basic video series is an introduction from NCARB that explains what each of the six sections of the exam will actually test candidates on. The videos are very straightforward and brief, so it shouldn’t take long for you to look at them all if you’re interested. Whether you’re taking ARE 5.0 or still working on 4.0, Mike’s guide, ‘How to Pass the Architect Registration Exam’ is a great place to start. Available as an e-book, physical book, and audiobook, this primer will help you understand the basics of the ARE, strategies for how to prepare, and how to work through the tough times on your journey. I’ve been a fan of the guys at Archispeak for some time now. Their podcast, an audio equivalent of Architects discussing topics by the water cooler, is a fun resource for those of us in the profession. Evan Troxel, one of the hosts, has recently launched his new book that extrapolates what he learned on his own ARE journey and turns the experience into a series of helpful ‘hacks’ for even the busiest of us to pass the ARE. Sometimes we just need an extra push. Mike’s Boot Camp takes students through an intensive, 10 week course to get them ready for their next ARE section. 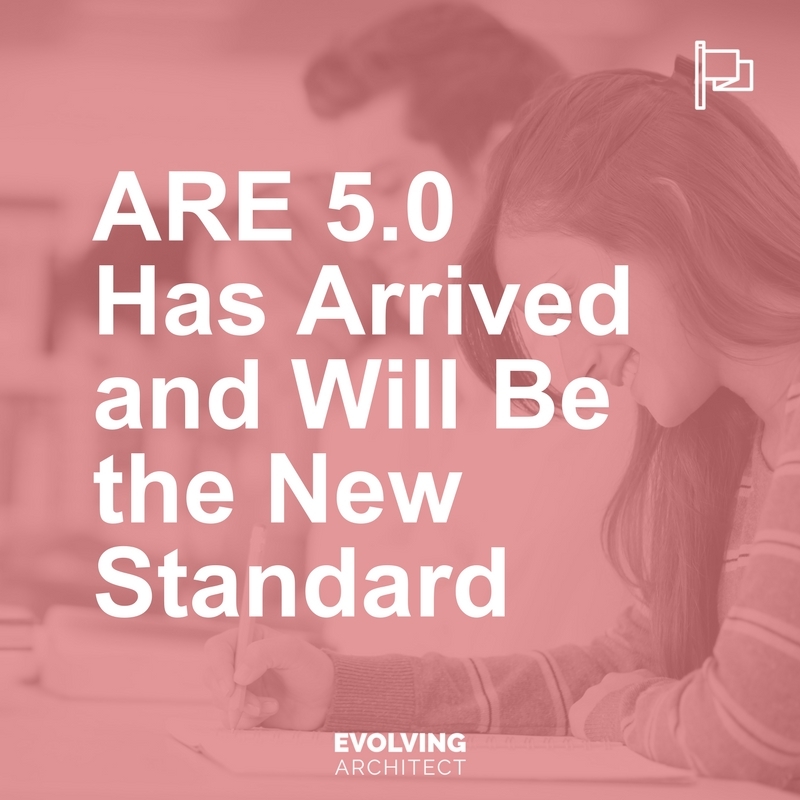 This week, I suggest you take a look at all of NCARB’s information out there about ARE 5.0. Even if it doesn’t directly apply to you, I bet it does apply to someone you know.